Mareah Steketee is a licensed clinical psychologist with specialty training in neuropsychology and Dialectical Behavior Therapy, who has a primary commitment to collaboration, mutual respect, and the pursuit of options that maximize safety, flexibility, and movement toward deep happiness and a high quality of life. She completed a year of pre-doctoral clinical internship followed by a year of post-doctoral fellowship in neuropsychological research at UNC-Chapel Hill. Her second year of post-doctoral neuropsychology fellowship was completed in the rehabilitation unit at Duke University Medical Center. 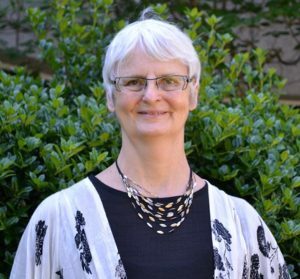 She was a Clinical Associate Professor at UNC-Chapel Hill in the Department of Psychology for eight years and maintained an appointment at Duke University as an Adjunct Associate in Medical Psychology, Department of Psychiatry & Behavioral Sciences for 15 years. In her current practice, Dr. Steketee offers neuropsychological and psychological evaluations as well as DBT Skills Groups, DBT Skills Groups for University students (DBT-U), DBT Graduate Groups, DBT-Substance Use Groups, and DBT Training Teams for therapists. She is not taking any new individual clients at this time. I am fascinated by the complexity of how the human mind and spirit interact with the environment and can learn to function ever more effectively. My approach to my practice is guided by my commitment to collaboration, mutual respect, and the belief that we are all doing the best that we can do. My simplest practice goal is to offer options for seeing any situation in a way that maximizes safety, flexibility, and depth. Supporting clients in this way can contribute to movement toward deep happiness and a high quality of life. I emphasize mindfulness-based practice in all of my work as well as my personal life. I also enjoy gardening, dancing, reading, travel, the good company of friends and family, and the quiet pursuit of my own rich quality of life. I aspire to live what I advocate for others in my practice. Appointments: Mon-Thurs. Call Paige Barnett in our Chapel Hill office to inquire about all neuropsychological evaluations and DBT Skills Groups (919.929.1227). You can also reach me through my Voice Mail: 919.442.1127.